Tomatoes: IS There a Bad Blight on the Rise? | Gardens Alive! Tomatoes: IS There a Bad Blight on the Rise? Here's the post Adam was reacting to: "Late blight is going to be a problem for tomatoes, potatoes and possibly eggplants during the 2012 season. The moisture that inundated the east coast over the summer and extraordinarily mild winter have combined to create an unusually comfortable environment for the proliferation of blight spores, which can lay dormant in soil and be carried by the wind as far as 50 miles in a day. Those who intend to grow tomato, potato or eggplant MUST take precautions early. [We] suggest that you use the powder form of copper, a fungicide approved for organic farming. Dust the soil with copper where you are going to plant your tomatoes, potatoes and eggplants and till the dust into the soil. Dust the seedlings at planting time and repeat this dusting twice over the next month. If you observe signs of blight later in the season (a spotting of the lower leaves and stems), dust the plants immediately and repeat the dusting in 5-7 days. If you follow the suggested protocols your plants will probably be okay. If you do nothing, you may lose your entire potato, tomato or eggplant crop." A. Well, the record rainfall of last summer and recent warm winter do have a lot of gardeners worried about a lot of things, but so far every concern I've brought to the attention of experts has elicited a big "don't worry". However, late blight is a really nasty actor, so I forwarded this warning to the researcher who guided us through the most recent outbreaks of that devastating disease, Dr. Margaret Tuttle McGrath (no relation; honest) from the Cornell University Department of Plant Pathology; Long Island Horticultural Research & Extension Center in Riverhead, NY. Her response? "While I agree that late blight could be a big problem in 2012, it would not be because of dormant spores surviving a mild winter," she wrote back. "As we have explained in past seasons, it would be due to the pathogen surviving in infected potato tubers that were left in the soil or in compost piles last season, or from infected tubers planted this Spring. "Without a potato host, the late blight pathogen cannot survive in soil over winter—at least not yet. But if the pathogen were able to achieve sexual reproduction (which it has not yet been able to do in the U.S.), it could form a type of spore that could survive winter dormant in the soil. This is another good reason to aggressively manage late blight when it appears; the fewer diseased leaves in the environment, the less chance of this happening. Destroy any potato tubers that survive the winter and any volunteer plants that develop from them. Tubers often sprout in the compost pile or in the garden from potatoes that were missed at harvest time the previous season. Purchase and plant only certified disease-free seed potatoes. Apply fungicides to foliage (not soil) on a preventive schedule; diseased plant tissue cannot be cured and must be immediately destroyed when discovered. "Eggplants are highly unlikely to be affected. While it is possible that evolution could result in a new strain that is able to infect them, it is highly unlikely—and applying copper or other treatments preventively on eggplants is not warranted. "In addition, I do not recommend applying copper to soil, and have never seen such a use described on the label of a copper fungicide. If a pesticide is used in a manner that does not conform to its label, it is a violation of federal law subject to a fine; that label is a legal document. Perhaps more importantly, earthworms and other beneficial soil organisms are sensitive to copper, and copper applied directly to the soil is more likely to reach these organisms in toxic doses than copper sprayed on plant leaves. "That's why I prefer liquid copper formulations. With liquid you get better coverage of foliage with less soil involvement (especially if it's not sprayed until it drips off the leaves), and liquid formulations also have 'stickers' to help keep the copper on the foliage. (And off of people—the precautionary statement on copper fungicide labels indicates that it can be harmful to people if inhaled, swallowed, absorbed through skin, or comes in contact with the eyes). All of the copper fungicides I know of that are marketed to farmers are liquid formulations." McG here again: Thanks, Meg—you are the source of reliable info on this fearsome foe! 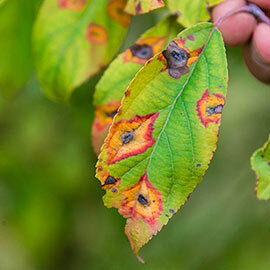 For lots more, visit Meg's excellent late blight info pages.